The most highly anticipated movie in the world — Star Wars: The Force Awakens — opens in just a few days, and the buzz for it is, understandably, through the roof. 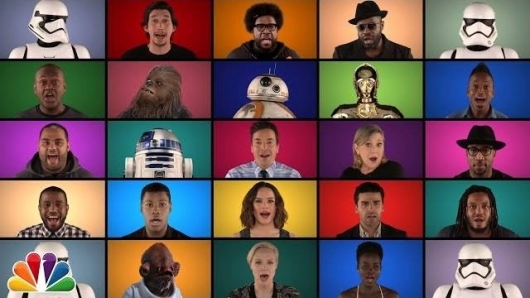 The cast of the film has been making publicity rounds lately for the film, including one very awesome segment on The Tonight Show Starring Jimmy Fallon, where they joined host Jimmy Fallon and his house band, The Roots, for an a cappella medley of Star Wars music! Watch the video of the medley here below! The Force Awaken stars Daisy Ridley, John Boyega, Oscar Isaac, Adam Driver, Gwendoline Christie, Lupita Nyong’o, Carrie Fisher, and Harrison Ford, along with BB-8, C-3PO, R2-D2, Chewbacca, and the Stormtroopers, joined Fallon and The Roots for this very fun musical feature. Star Wars: The Force Awakens opens in theaters on December 18, 2015, with select showings the day before.